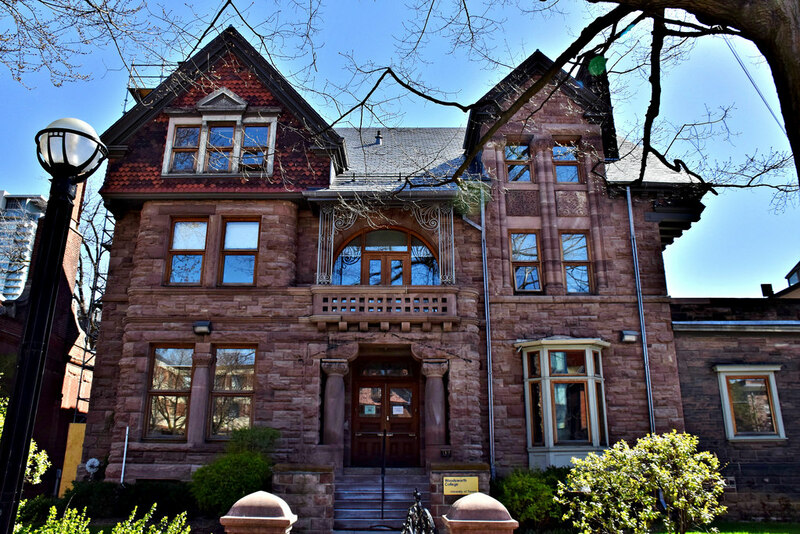 The department of students housing and residence life at the University of Toronto St. George creates a holistic student experience that will promote academic and personal success. The institution provides facilities that are safe and secure, well maintained, and competitively priced in an effort to foster a supportive community that values diversity, equality, and inclusion. Chestnut Residence is open to the Arts & Science, Architecture, Engineering, Kinesiology & Physical Education and Music students. The residence is a traditional dormitory-style residence with large double and single rooms. The residence holds 445 double occupancy single-gender rooms and 242 single rooms. The double rooms are available for first year students, and single rooms for upper-year students. All rooms have an en-suite washroom and weekly cleaning service. Graduate House is open to graduate and second-entry students only. It is a shared-apartment-style residence with single, premium single, and double rooms in 3-, 4-, and 5-person same-gender apartment suites. Each suite shares 2 to 3 washrooms (with at least one tub/shower), a full kitchen, and a furnished living area. Also, the residence has low to medium lighting in corridors and stairwells, natural lighting in residence room, supplemented by artificial lighting, adjustable air-conditioning and heat in each suite and elevator access to all 9 floors. Gowan court offers residence to both students and civilians in Toronto. The building has bachelor, one and two bedroom apartments. There is easy access to public transit and the Don Valley from the residence. Some of the features within the suites include parquet flooring, new appliances, roomy living area and kitchen, and breath-taking views of the city. There is also a fully equipped gym, party room/lounge, controlled-access lobby, laundry facilities on site and ample parking. The Latimer is surrounded with a variety of restaurants, shops, transit and entertainment joints. It also offers close proximity to public transportation giving easy access to all parts of the city.The residence features renovated kitchens & bathrooms with designer touches and chocolate parquet floors. Residents also enjoy an on-site dry cleaner and laundry facilities, fast elevators and ample parking. The Maitlands is located in a classic downtown neighborhood with tree-lined streets, quaint restaurants and cafes and the University of Toronto. The building still retains the original hardwood floors and stained glass windows, and is fully renovated with modern stainless steel appliances, including dishwasher, custom cabinets and ceramic tile. It also has a renovated lobby and common areas, controlled-access lobby, laundry facilities and parking. Located in the heart of downtown Toronto, the property and suites have been newly renovated to high standards. The suites have new kitchens, with all-new stainless steel appliances, chocolate-brown parquet floors, brand new bathroom and stunning views of the city. The building is close to TTC, Eaton’s Centre, Ryerson, George Brown, and the University of Toronto. Other features include lobby and common areas, a fully equipped gym, laundry facilities and ample parking. Residents at Garden View Apartments can walk to Ryerson, George Brown, Eaton Centre and the financial district with ease. They have convenient transit options, from subway to streetcar and buses. The units feature upgraded in-suite finishes, and spacious living and kitchen areas. The balconies are a perfect place to unwind and enjoy a great view of the city. Other notable features include and elevator, laundry facilities, controlled-access lobby, and ample parking. The newly renovated residence has bachelor, one and two bedroom apartments for rent.. Sitting at the corner of Bathurst & Richmond, the units feature 13-foot ceilings, and new designer-blessed kitchens and bathrooms. The residence neighbors restaurants, stores and schools. Other features include laundry facilities, controlled-access lobby and an elevator. Located in the one of the most sought-after neighborhoods in Toronto, the Broadview Mansions contains bachelor, one and two bedroom apartments. The suites feature a new kitchen with modern stainless steel appliances, an upgraded bathroom, chocolate-brown parquet flooring and lots more. The building has a fully equipped gym, storage lockers, laundry facilities, and ample parking. Lord Dufferin Apartments are renovated suites with new appliances, a modern open concept kitchen and chocolate-brown parquet flooring. The apartments hold bachelor, one and two bedroom apartments. Enjoy all the views from your large balcony of the east which showcases the impressive city skyline, views to the south offer sweeping Lake Ontario to the north is a glorious residential landscape unique to Toronto and to the west, courtyard views.